US equities opened significantly higher to sp'2074, but with significant cooling into the afternoon, the VIX rallied, settling +1.6% @ 19.97 (intra low 17.20). Near term outlook is uncertain, and will seemingly be largely dependent upon whether the Greeks can agree on something by early next week. 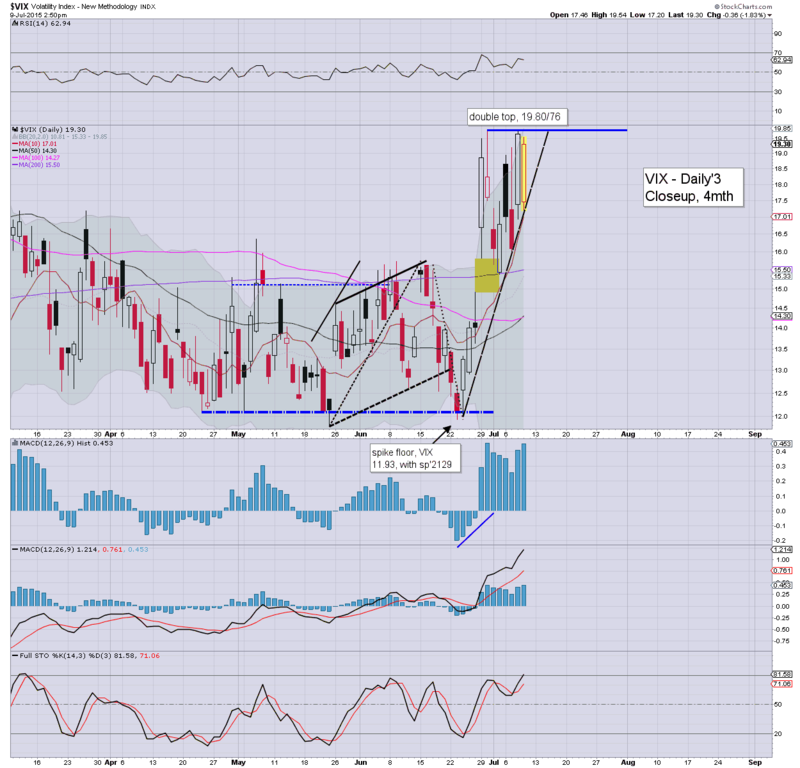 *VIX saw a brief spike into the close... fractionally breaching the key 20 threshold. 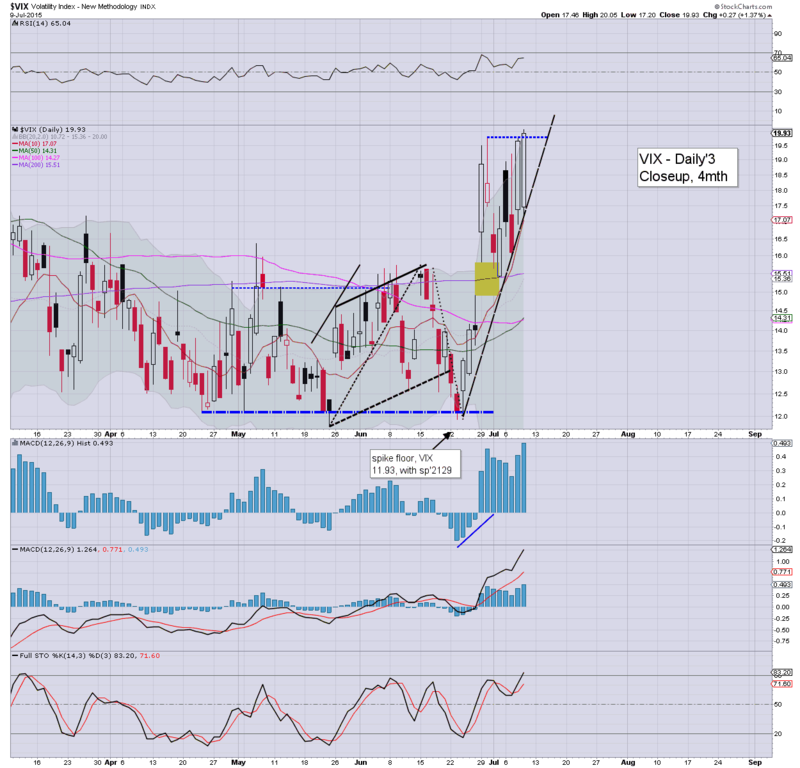 VIX has been broadly stuck in the 16-19 zone for 8 trading days. From a pure cyclical perspective, VIX is due to cool back into the low teens, but with the Greek situation still not even provisionally resolved, the market is obviously concerned that matters will continue to spiral out of control, with a GREXIT by the autumn. Considering the likely lack of any clarity by the Friday close, the VIX will now be able to achieve a weekly close in the 20s... last seen in February. *continued minor weakness in the closing hour. Price structure is still arguably a bull flag, although I realise some would be dismissive of that view, not least after the bulk of the morning gains dissolved across the day. 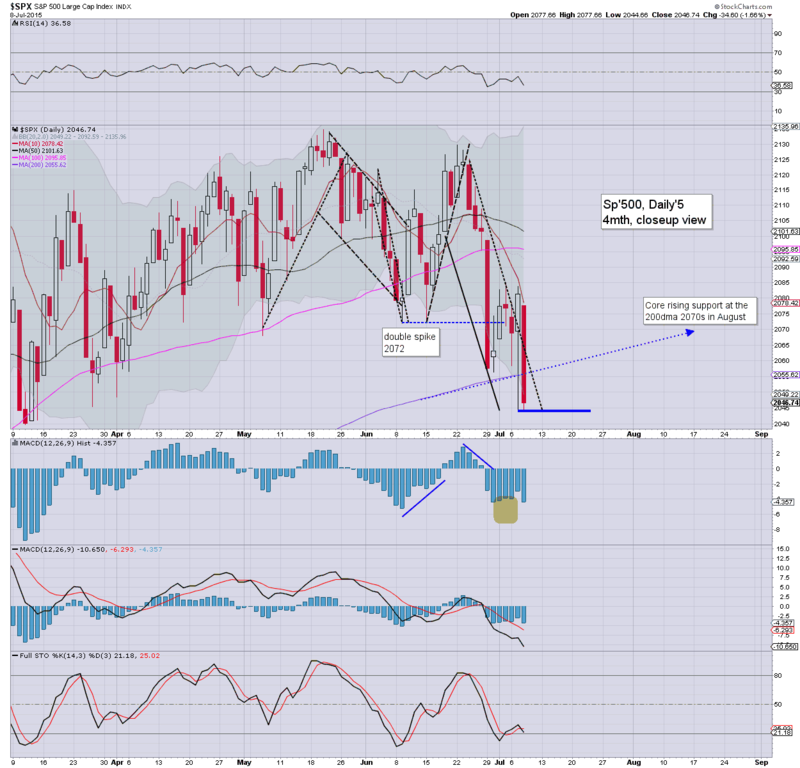 The second consecutive daily close under the 200dma. A tiresome day.... with a US market that seems hostage to the Greeks and the Chinese. For now.. I think I'll leave it at that. 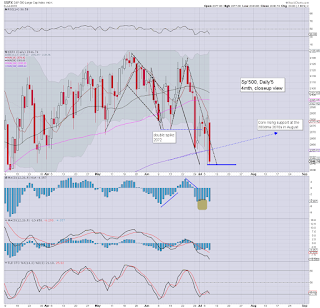 US equities remain moderately higher, but the closing daily candles are looking pretty ugly. The morning high of sp'2074 is a clear 1% higher... and the VIX is back in the mid 19s.. .threatening a serious break above the key 20 threshold. *price structure on the smaller 60/15min equity cycles remains a bull flag.. but that is perhaps stretching it. From a pure cyclical perspective... the threat remains to the upside. What should be clear.. this market remains very vulnerable to sporadic Greek headlines... and along with many others, I'm starting to get real tired of it. The Greeks have a great deal to answer for. 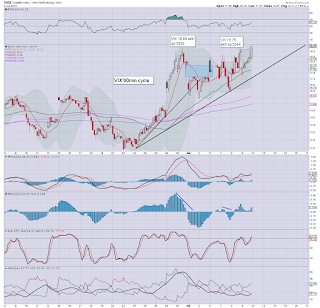 Those on the long side had better hope China has a net daily gain tonight...any sig' renewed weakness would be a real problem.. as the 3K threshold would be next natural downside.. and that is a full 20% lower. 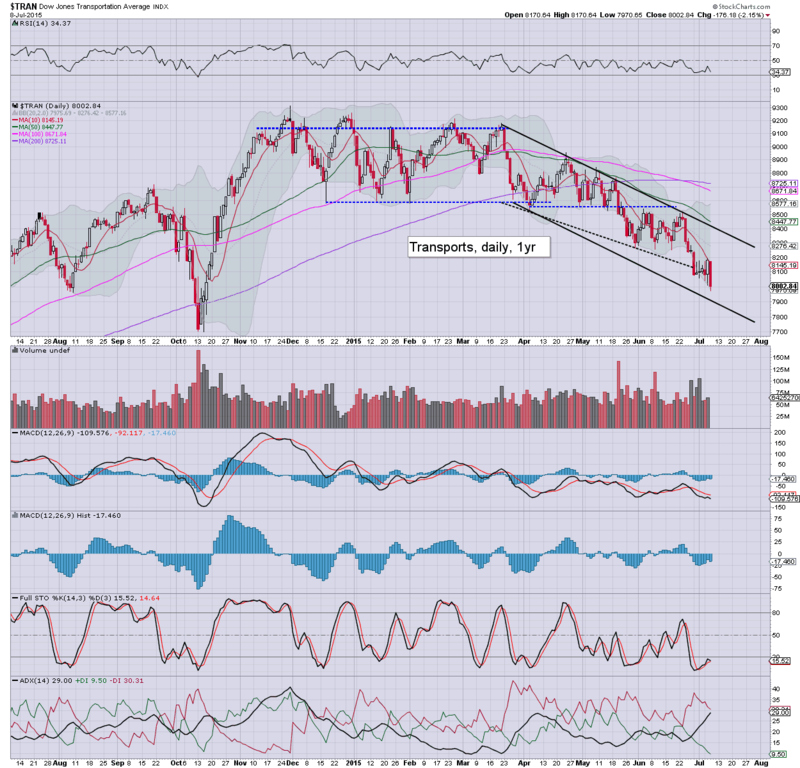 notable weakness, INTC -2.0%... having lost the key $29 threshold. US equities are battling to hold moderate gains, having slipped a little further to sp'2055. Price structure remains a bull flag.. but clearly, any net daily decline would make for a massive failure for the bull maniacs. 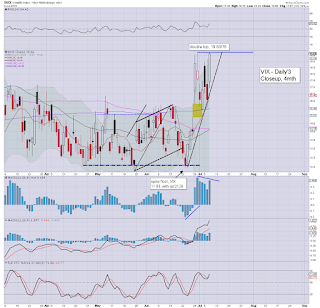 VIX is reflecting some concern about the completely unresolved Greek situation. Well, its the 2pm hour... we've seen almost a full 1% cooling from the earlier high of sp'2074. The bull maniacs need to see at least the 2060/65 zone by the close... otherwise.. the daily closing candles are going to settle real ugly. notable weakness: INTC, -1.4% @ $29.04... in critical/imminent danger of losing the key $29s.. having significant swung from an opening high of $29.89. I would not get into one of those wild spinning mechanical monsters for almost any amount of momo/hysteria stock. ps. bullish ice cold KO. US equities have continued to cool from the earlier high of sp'2074... to 2058. 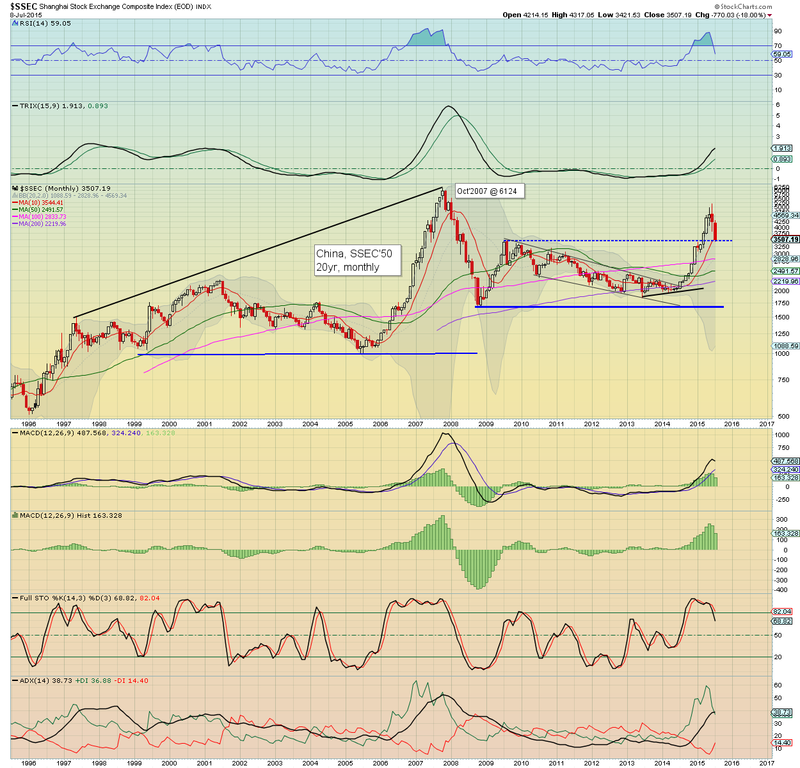 Price structure is arguably a baby bull flag, offering renewed upside into the close. 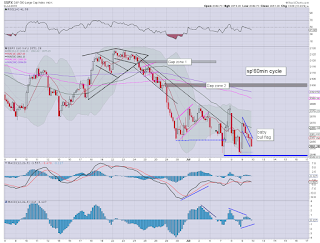 As of Friday, resistance will be 2068.. and that seems a viable key target within the next 2-4 trading hours. *unless equity bears can break into the VIX 20s... bulls should not be overly concerned at what are some rather strong intraday swings. Best guess remains... a break above resistance... sp'2075 (today), 2068 (tomorrow), such a break should offer clarity that further upside is due next week. 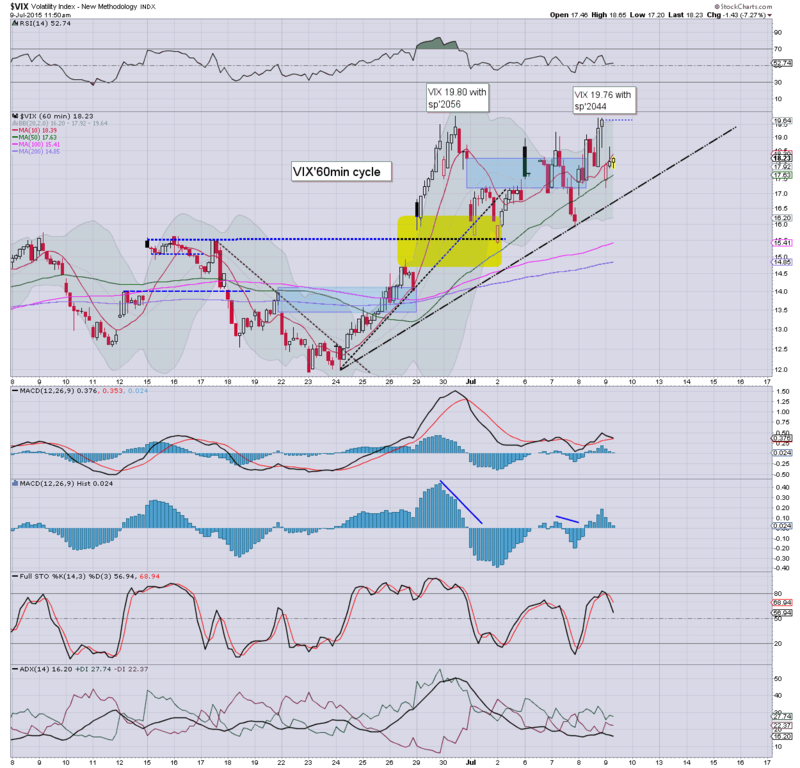 weakness: INTC -0.8% in the $29.20s... a third day battling to hold the key $29 threshold. *price structure on the smaller 15/60min cycles is arguably a bull flag... bodes for renewed upside into the 2070s this afternoon. Unless the equity bears can break <2044.. along with VIX 20s - which seems unlikely, this is mere chop ahead of a break above 2075.. and straight into the 2100s. US equities have moderately cooled from the early high of sp'2074 to 2061... confirming the opening VIX reversal candle. VIX itself is -6% in the 18.30s. Unless the Greeks can put forward an improved offer to the Troika in the coming days, along with continued China gains... this market remains vulnerable. 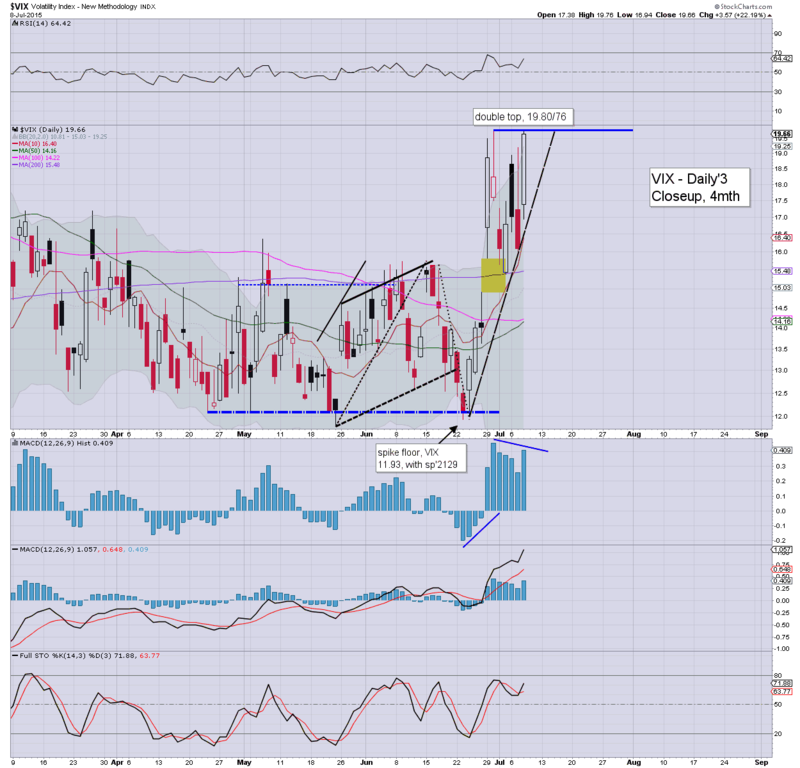 The opening VIX reversal candle was certainly something to be taken seriously... frankly, it seems increasingly vital for the bulls to break >sp'2075. Best guess... market breaks >2075... and proceeds into the sp'2100s. notable weakness: INTC -0.9%... having swung from the $29.80s to 29.20s. 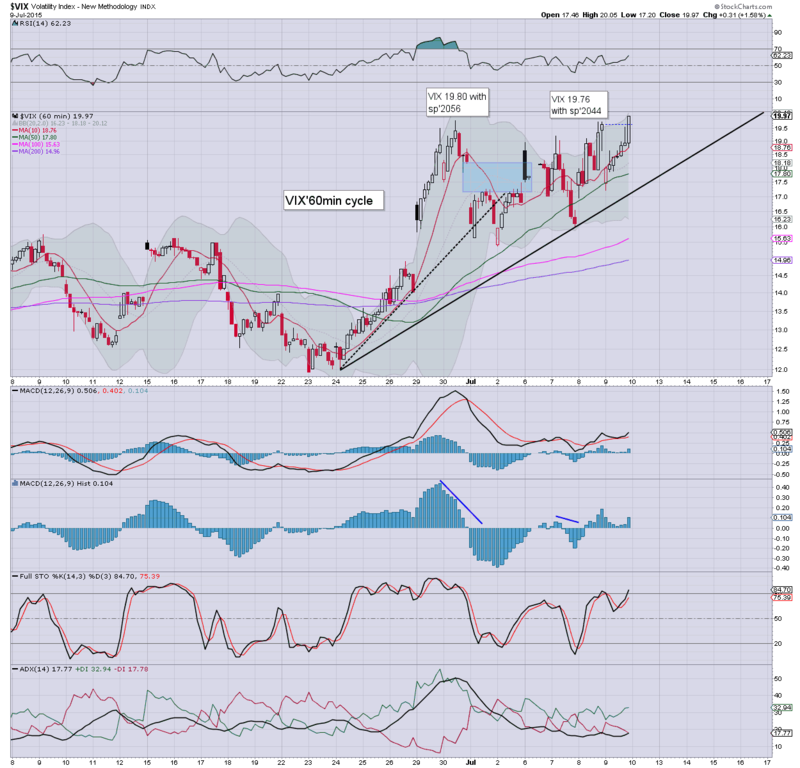 The $29.00 threshold remains critical to hold. If lost... it would bode for sub sp'2044s next week... although I realise many would disagree with such an extrapolation. So, strong gains... but it remains the case that the market is highly vulnerable to any sporadic Greek news headlines. 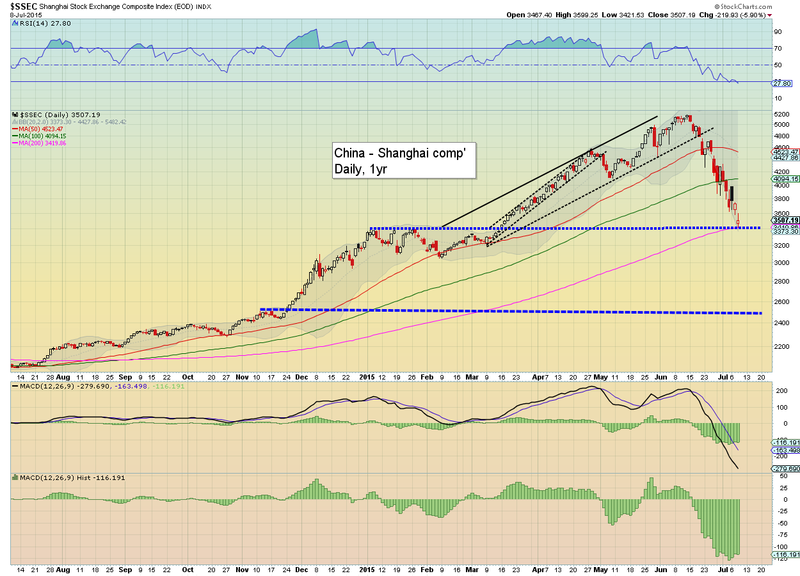 It will be important for China to have another a second consecutive net daily gain.. to conclude the week. *opening reversal in INTC.. swinging from the $29.80s to the 29.20s.... I've no idea why. Core support remains the $29s... that had better hold.. or its a major problem. Good morning. Equity futures are significantly higher, sp +20pts, we're set to open at 2066. Bull maniacs should be seeking a daily close >2075, along with VIX in the 16s. There is a very viable double floor of sp'2044, with a double top in the VIX of 19.80/76. Oil has early sig' gains of around 2%. So.. we're set for strong opening gains... but it will difficult to break above resistance @ 2075 by 11am. 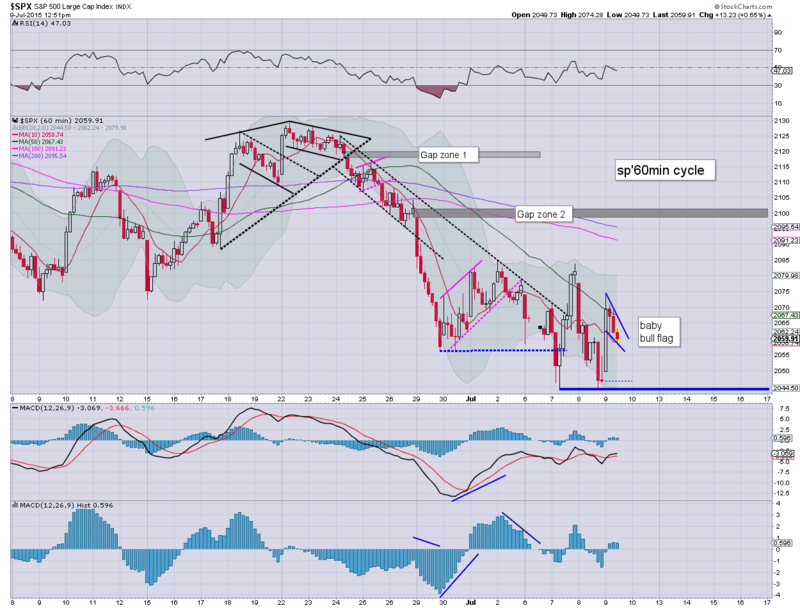 Indeed... weakness from 11am - 2pm seems probable... but still, a net daily gain. From a pure cyclical perspective.. the daily/weekly cycles are offering broad upside into August. In my view, the only issue is whether we break another set of new highs... before resuming lower.. in a more severe.. and sustained manner. *I am long INTC. .will strongly consider exiting in the 10am hour... and maybe pick up again later this afternoon. AA, +1.1%.. post earnings reaction. Overnight China action: naturally, the volatility/swings continue.. with early weakness of 3/4%.. to a new cycle low of 3373, but then rebounding powerfully, settling +5.8% @ 3709. It would seem we have a floor around my target zone of the 3400s... now its a battle back above 4K... probably to 4300/4500 zone. *I read that the Chinese police are on the hunt for the 'malicious short sellers'. Yeah.. that figures. China Govt, along with all media, cared nothing when the Shanghai comp' was 2K in May 2014. Yet.. when its trading in the 3300s.. it is seen as 'omg, panic.. lets make selling illegal, blame the short sellers'. There is an almost complete lack of perpective amongst the majority.. although I guess I really should not be surprised. 8.31am.. weekly jobs.. 297k... still 'reasonable'.. at least relative to the metric that it is. Santelli on CNBC notes the issue of 'holiday issues'.. which could account for slightly higher number. 8.53am... sp +23pts... we're set for 2070... given 90mins... a break over 2075 would be pretty significant... along with VIX 16s. 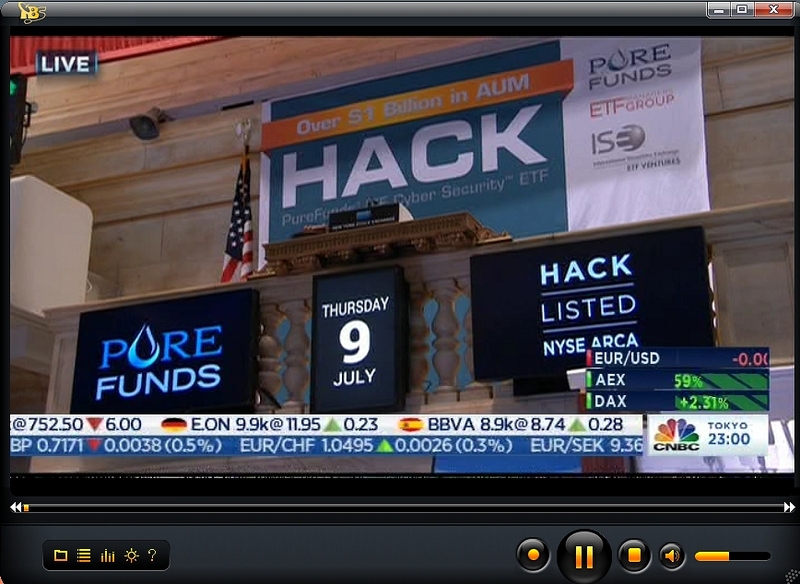 9.02am... Oh yeah... look who opens the NYSE today..
.. but hey.. don't dare suggest the NYSE.. and other places were hacked yesterday. Hell no.. you can't think that! Having collapsed from 5178 (June 12th).. to last nights new cycle low of 3421, the Shanghai comp' is likely close to completing a very natural retrace. A bounce to 4300/500 zone looks probable into August. 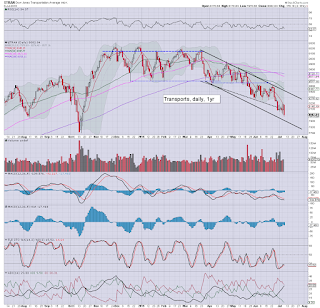 However, considering other world indexes.. renewed weakness to 3K.. or even 2500 remains viable in Sept/Oct. The bigger monthly cycle tells the real story. A clear mid term peak in June.. and regardless of any upside into August... I would imagine another major wave lower in Sept/Oct. 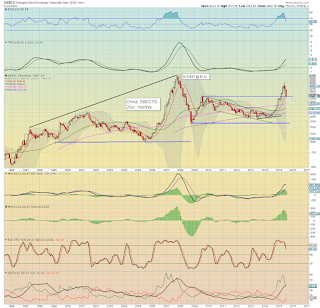 Long term... new historic highs look due... above the 2007 peak of 6124. It will be interesting to see how long it will take the tens of millions of Chinese who have only recently got a trading account.. to have renewed confidence in their equity market. Not that long... I'd imagine. Thursday will see the usual weekly jobs data. *there are 3 fed officials on the loose tomorrow... I'd have to guess at least one of them will say something that will capture the markets attention. US equities closed significantly weak, sp -34pts @ 2046 (intra low 2044). The two leaders - Trans/R2K, settled lower by -2.1% and -1.5% respectively. 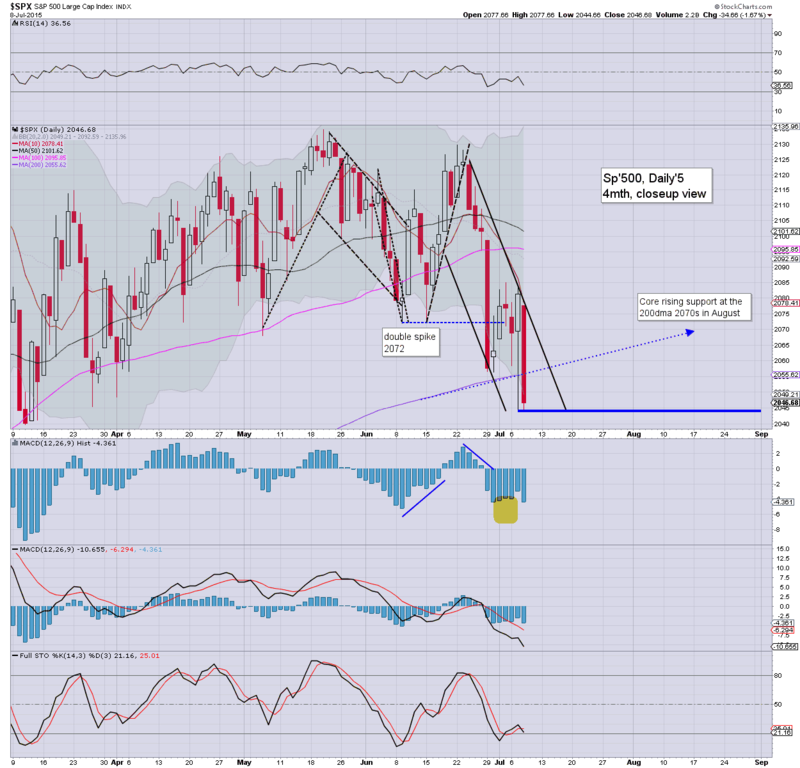 Near term outlook is for renewed upside into the sp'2100s... regardless of the ongoing Greek/China issues. 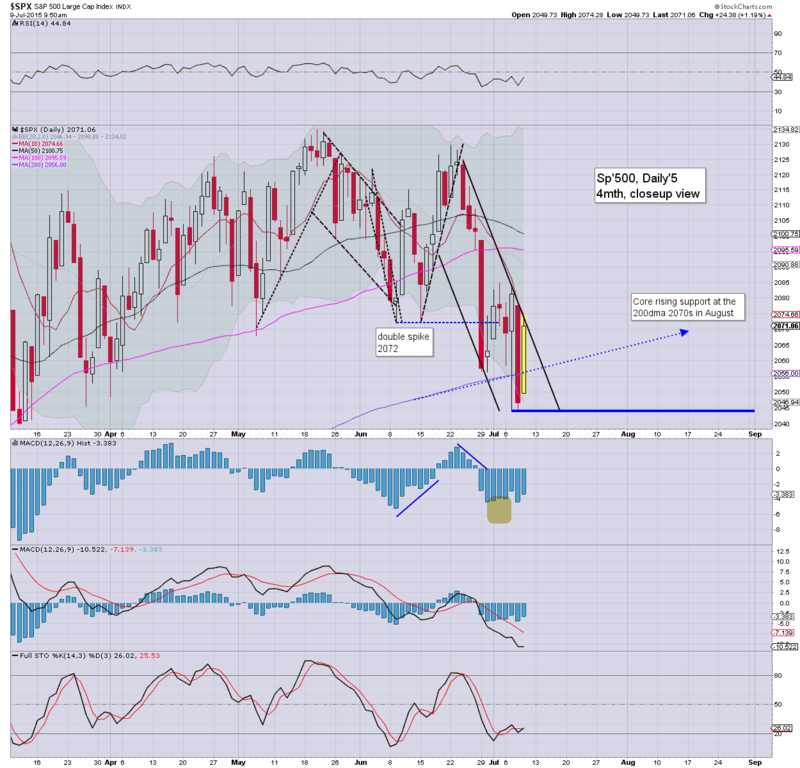 Suffice to add.. a day for the equity bears, although most indexes held the Tuesday low.